In order to navigate a typical facility, an autonomous mobile robot must be able to open doors and navigate through them successfully. Simple cost effective wireless devices and a little logic make this task very easy to implement. This image shows Frances commanding the door to open using her point to point wireless communication module. 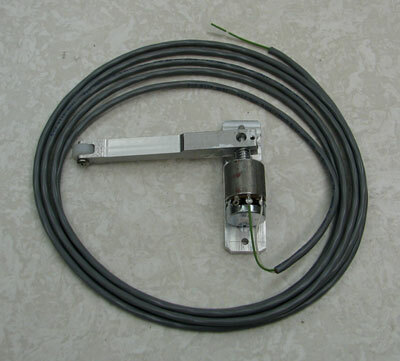 The door operator is a standard device typically found in most commercial, industrial, and institutional facilities. Any robot can open a door when it swings outward. Frances was also able to navigate doorways that swing inward her first day on the job. 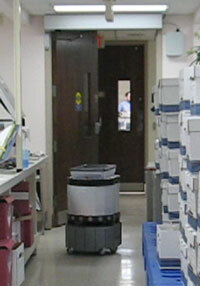 The above image shows her rolling into a lab area after first commanding then waiting for the door to completely open before proceeding. 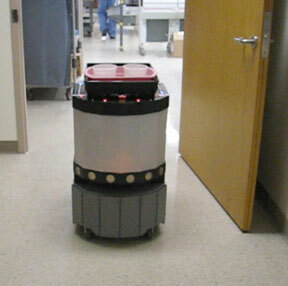 Accessories such as hinge encoders, magnetic contacts, and proximity detectors enable autonomous mobile robots to navigate doorways for years without human intervention. All door operator products come standard with proprietary wireless communication modules. There is no need to install WiFi infrastructure nor wrestle with the complexities and politics of existing corporate environments. Every device and robot becomes a repeater in a self configuring mesh-like wireless network. However, if WiFi is preferred, all products can optionally utilize standard 802.11 interfaces.